Ingredients: Soy protein isolate†† (soy), fructose, Dutch processed cocoa, plant sterols (soy), dicalcium phosphate, olive oil, natural flavors, soy fiber (soy), magnesium citrate, inositol, silica, inulin, proprietary blend of RIAA and acacia [magnesium salts of reduced iso-alpha acids (from hops extract, Humulus lupulus L.), hydrogenated soybean oil encapsulate, and acacia extract], lecithin (soy), cinnamon bark, magnesium chloride, sodium chloride, xanthan gum, potassium chloride, guar gum, chromium polynicotinate, ascorbic acid, biotin, zinc gluconate, pyridoxine HCl, d-alpha tocopheryl acetate, niacinamide, copper gluconate, D-calcium pantothenate, thiamin HCl, riboflavin, retinyl palmitate, folic acid, L-5-methyltetrahydrofolate, potassium iodide, cyanocobalamin, and cholecalciferol. Contains: soy. † Saturated fat is contributed by olive oil, which has recognized health benefits. †† Non-Genetically Engineered, Identity-Preserved Soy Protein. Ingredients: Soy protein isolate†† (soy), fructose, soy fiber (soy), plant sterols (soy), inulin, natural flavors, dicalcium phosphate, olive oil, magnesium citrate, inositol, silica, potassium chloride, proprietary blend?? of RIAA and acacia [magnesium salts of reduced iso-alpha acids (from hops extract, Humulus lupulus L.), hydrogenated soybean oil encapsulate, and acacia extract], lecithin (soy), cinnamon bark, sodium chloride, xanthan gum, guar gum, chromium polynicotinate, ascorbic acid, biotin, zinc gluconate, pyridoxine HCl, d-alpha tocopheryl acetate, niacinamide, copper gluconate, D-calcium pantothenate, thiamin HCl, riboflavin, retinyl palmitate, folic acid, L-5-methyl tetrahydrofolate, potassium iodide, cyanocobalamin, and cholecalciferol. Contains: soy. 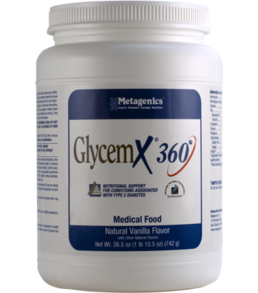 Directions: Blend (for no longer than 15 seconds), shake, or briskly stir about 2 level scoops of GlycemX 360° (54 g) into 8 ounces of chilled water twice daily, or as directed by your healthcare practitioner. Consume within 10 minutes of reconstitution. Caution: Do not use if pregnant or nursing. Not recommended for individuals taking anticoagulant medications. If you are taking blood sugar lowering medications, dosages may need to be altered when using this product. Please discuss this important concern with your doctor. Formulated to Exclude: Wheat, egg, dairy products, nuts, tree nuts, fish, crustacean shellfish, colors, artificial sweeteners, artificial flavors, and preservatives. Contents sold by weight, not volume. Some settling may occur during shipping and handling. Serving size is measured by weight with a scoop included for your convenience. The amount of product contained in 2 scoops may be above or below 46 grams due to variations in handling and product density.